I've seen my first micro moth of the year on Ffos Las which I think is probably a Cydia ulicentana. 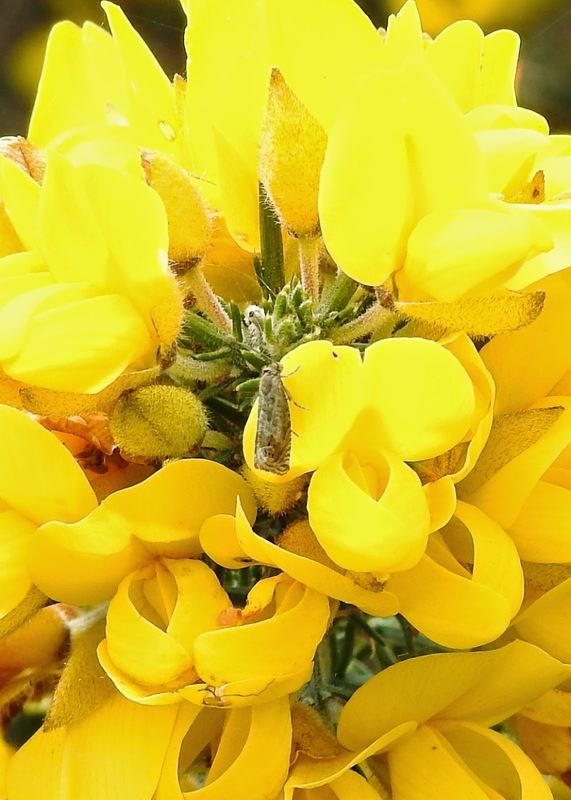 Having read Ian Morgan's blog of Mon 27th April, I've learnt that these are common on gorse (as mine was with 3 others) but neither of my moth identification books have this moth illustrated so I used his naming to look on the internet for identification. I am very new to moths so please forgive posting of what is probably very common for the rest of you. 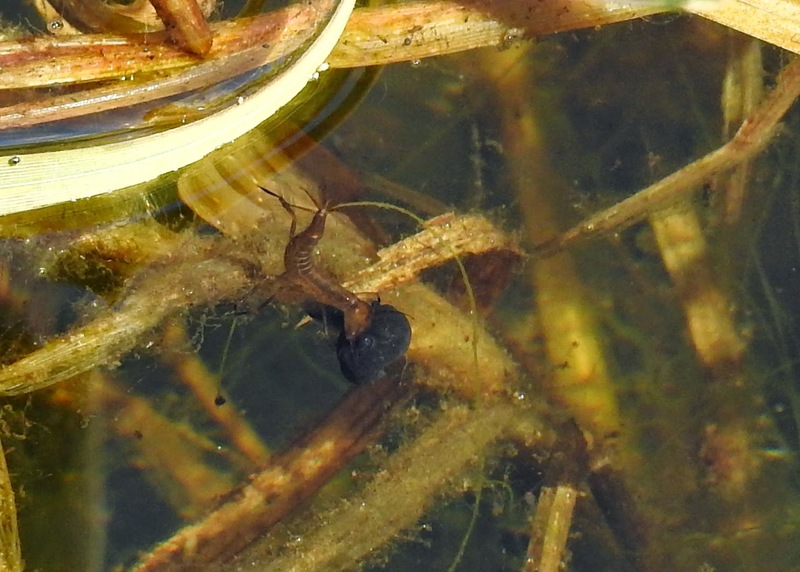 The ponds are also bursting with activity and the photo above shows what I think is a damselfly larva with a tadpole, and the picture below shows one with a dragonfly larva. 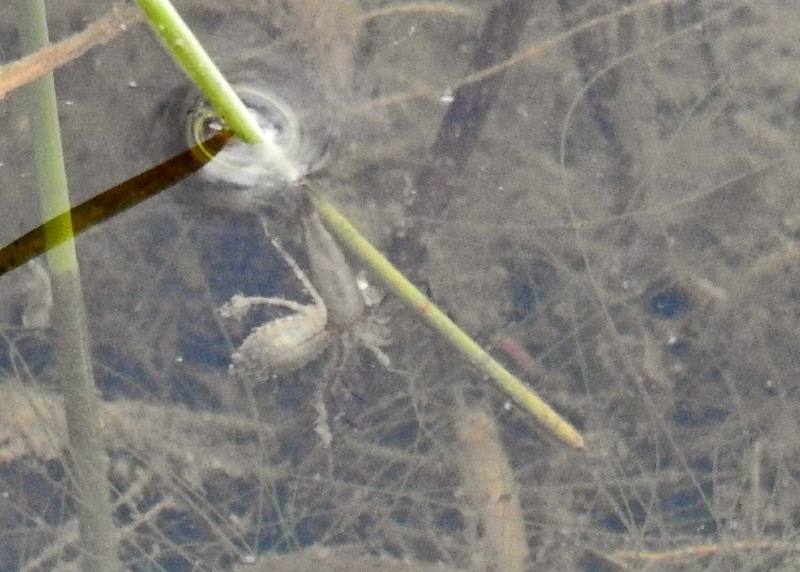 I don't know if either photo is good enough to identify the larvae, but it is hard getting the camera to focus on an object under water. This photo of a leaf mine on bramble was taken on 26th April, as were the two larvae above. Does anyone know what it was made by? What an interesting post, Maggie - with great photos, too. Congratulations on your glowworm records; it's half a century since I last saw one of those (in Hertfordshire), so I'm a bit jealous. I am no expert on micromoths, but I'm quite confident that your leaf mine was made by Stigmella aurella; others will probably be able to name the moth on the gorse.
" It will be very useful to know of glow worms in moth traps, but I have to say that this is a two-edged sword. If a glow worm is attracted to a moth trap, I think it is highly likely that he will never find a female glow worm. Males usually fly only a short distance to find females and conserve energy if possible. But they are known to fly by maybe 500m or so to a bright light, and I think it unlikely that they will just brush themselves down and then find their way back to the dim glows of a female if released. 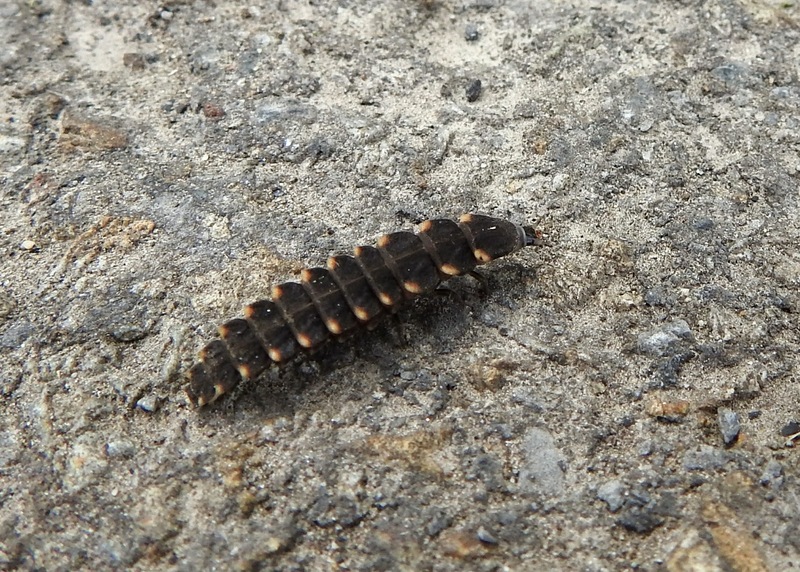 We know very little about whether a male glow worm has the energy resources or the navigational skill to return to his former location having been attracted away, so it's possible that there is no problem. But to be on the safe side, if a glow worm is caught in a moth trap, it would be very helpful to identify where the females are to be found and try to make sure the trap is not visible from that location." Bear in mind that there is the possibility of confusing glow worm larvae with those of the genus Silpha (a type of carrion beetle) and, like glow worms, they feed on snails. The larvae are very similar indeed...I can`t off the top of my head remember the easiest i/d feature. Contrary to what Robin Scagell has suggested, glow worms, whilst much declined (and seen less often as people are home watching telly these days), have been recorded in our area, with the records sent off to the then Biological Records Centre scheme organiser, Dr Keith Alexander. Some I summarised in a note, `Scorpions, Stick Insects and Jack with the Lantern` on pp28-30 of the Llanelli Naturalists Newsletter, No 55, Summer 1993 (available on the Llanelli Nats website...go to `newsletters`). In it, I note that Barry Stewart had this species (adults) at nearby (to Ffos-las) Pinged in July 1993. Thanks for the additional information and I'll look up the Llanelli Naturalists newsletter to read more about it. About 20 years ago I did see a glow worm shining on a clump of saxifrage in my back garden in Trimsaran one summer evening. I can't remember the exact year, but my daughter was quite young and she is 28 now. I haven't seen any in the garden since. On the moths - yes your Tortrix is Cydia ulicetana (very common on Gorse), and your bramble leaf mine is almost certainly Stigmella aurella as Steve has already said. Ffos-las is a logical site to expect glow worms, with its dry soils and often vaguely-calcareous (when fresh) Coal Measure shales. I`ve only witnessed `shining` adult males, with their greeny-yellow luminescence, abroad. The Llanelli Nats article that I refer to also gives its local Welsh names, as collected by Cymdeithas Edward Llwyd, as well as Carms records. Keep up the good work, Maggie - your recording at Ffos-las and elsewhere is really worthwhile. Thank you all for your kind comments. All my sightings are "lucky" as they are seen whilst walking the dog - mine is well behaved and has learnt to sit quietly if I'm looking through binoculars or have the camera to the eye. The young collie I sometimes have as with me has yet to learn this and bounds round enthusiastically scaring everything off! !